Zaluska was assaulted while out in Ashton Lane in west end of Glasgow on Monday. 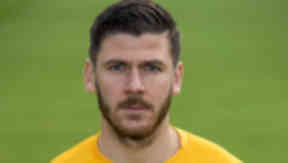 Celtic goalkeeper Lukasz Zaluska has been attacked in the street by a fellow Scottish Premiership player while on a night out. Zaluska, 32, was assaulted by a player, who cannot be named for legal reasons, while out in the west end of Glasgow on Monday. Police were called to the scene of the attack in Ashton Lane in the early hours of Monday morning. The extent of the Celtic goalie's injuries are not fully known, however he suffered a head injury and blood loss. Two other Premiership players were also present at the scene and were spoken to by police. However, it is not yet known the full extent of their involvement in the incident. It is understood the Celtic number two was on his way home when the attack took place. He was approached by the player while making his way to a taxi in the city's Ashton Lane. Police say they have now launched an investigation into the incident and are examining CCTV for evidence. A statement from Police Scotland said: "Police Scotland are investigating a report of an alleged assault on a 32-year-old male in Ashton Lane, in the west end of Glasgow, in the early hours of Monday morning. "Police inquiries are ongoing, including the monitoring of CCTV." Celtic were unavailable for comment. Former Celtic manager Neil Lennon was assaulted in Ashton Lane in September 2008. He was knocked unconscious in the incident and two men were convicted. The attack on Lennon happened hours after Lennon was in the Celtic dugout during his club's 4-2 home defeat to Rangers.